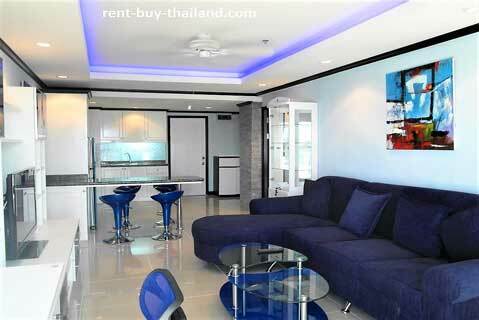 This is a luxury one bedroom sixteenth floor sea view condo at Jomtien Beach Condominium S1, within a very short walking distance of Jomtien Beach. The apartment has been remodeled to a very high standard and is superbly decorated and tastefully furnished throughout. 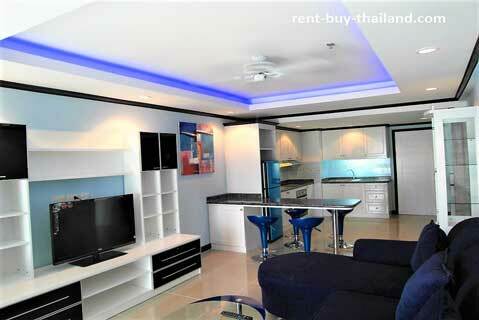 The apartment consists of an open plan living, dining and kitchen area, a large bedroom, a bathroom and a balcony. Being fully and stylishly furnished it is ready for you to move in to now! The stunning large, European style kitchen is ultra modern and features excellent under cupboard lighting. The kitchen is fully equipped with all you need, including pots and pans, crockery and cutlery and cooking utensils; in addition there is an oven, electric hob, extractor fan, microwave, refrigerator and plenty of storage space. 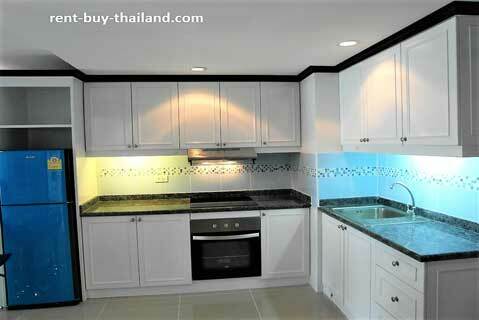 The kitchen also features a stylish breakfast bar with stools. The main living area contains a large corner sofa, a coffee table, display units, and a flat screen TV and DVD player, along with a desk and chair providing work space and access to the balcony via large sliding patio doors. The modern, fully tiled bathroom has been finished to a high standard, and includes a large stylish glass basin unit with storage underneath and a large walk in shower. In addition there is also a washing machine. The large bedroom is furnished with a double bed, bedroom furniture providing plenty of storage space, including a large wardrobe, drawer units and bedside tables. There is also a flat screen TV and access to the balcony through large sliding patio doors. The balcony includes balcony furniture and provides fantastic city and sea views, making it a great place to relax and unwind. The apartment also benefits from feature ceilings with concealed dimmer lighting in the living area and bedroom, as well as tiled flooring, curtains, down lighting, air conditioning and ceiling fans throughout. Residents at Jomtien Beach Condominium S Buildings enjoy some fantastic amenities, including: a beautiful salt water swimming pool with a children's pool, fitness center, children's play area, undercover parking, and a range of small businesses within the complex such as laundry, WiFi (available to purchase), massage and beauty parlors and shops; there is also 24 hour security. 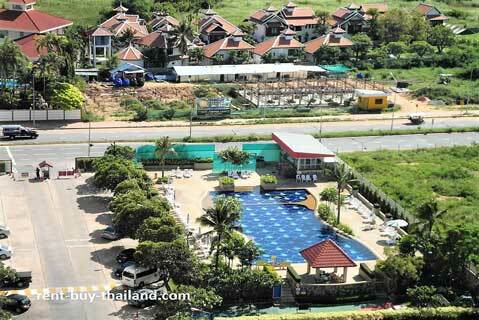 The complex is very close the fabulous 6 km long sandy Jomtien Beach, which offers plenty of space to relax on the many beach chairs here, along with a choice of water-sports to partake in. Jomtien is home to a variety of restaurants offering a range of cuisines, from local to international; a lively nightlife with a great atmosphere - a large variety of bars, cabaret and entertainment venues to choose from (including Super Town - Jomtien's Walking Street); there are also many shops, fresh food markets and two great night markets. Central Pattaya is easily accessible from the condominium, being a short drive or Baht Bus ride away - the main Baht Bus route between Jomtien and Pattaya running along Beach Road close-by. Central Pattaya offers a very popular and lively nightlife, with a multitude of nightclubs, bars, restaurants and cabaret shows as well as the famous Walking Street; there are also plenty of shops, markets and a variety of tourist attractions in the area for the whole family to enjoy. Rent-Buy – Easy payment plans available, no credit check needed - own your apartment with easy installments. 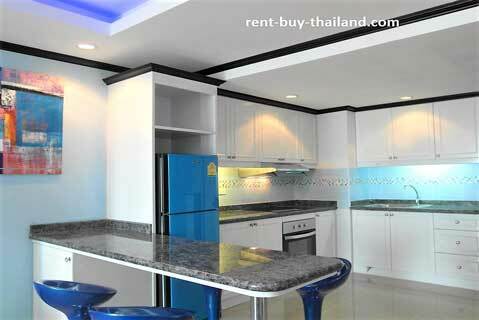 Other Pattaya condominiums for sale or rent around the area are available, please inquire for further details.